The Lastolite Brolly Grip Handle is an effective diffusion solution for what Lastolite would call the "solo strobist." For the dexterous that means that you can handle your autofocus DSLR with one hand while effectively using your arm as a light stand for your umbrella. Lastolite makes it easy with the Brolly Grip Handle which alternatively mounts on a 5/8 (16 mm) stand stud and holds optional umbrellas up to 20". Box Dimensions (LxWxH) 9.6 x 1.7 x 1.2"
Brolly Grip Handle is rated 3.5 out of 5 by 11. Rated 3 out of 5 by Lynette from Cool concept I want to use this handle with a couple of umbrellas. Works great for holding the umbrella, a speedlight and even a pocket wizard TT5 with the speedlight on top. So if you have an assistant to hold it, it works perfectly. 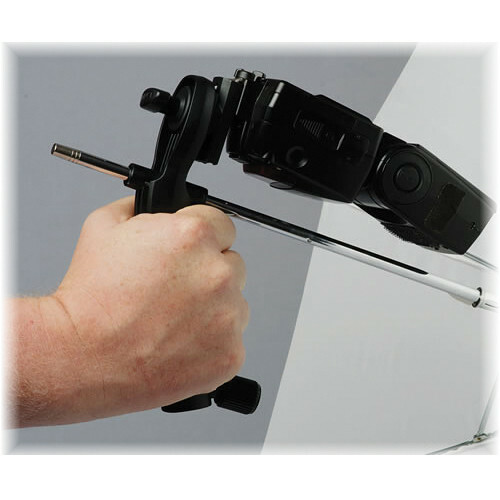 If you want to mount the grip onto a light stand using the bottom socket and screw, the screw on this one does not function, so we could not attach it! I did not have time to exchange it before a trip. Rated 5 out of 5 by Anonymous from It's just what I needed I've recently started doing outdoor portraits and used reflectors. I wanted to have something to soften fill flash. This with a small umbrella is perfect for my speedlite. My flash and remote switch fit perfectly. The bottom of the handle will fit a light stand but the handle grip makes it easy to hold off camera. It is small and fits in my backpack with a small umbrella. Rated 4 out of 5 by Brian in Seattle from It does the job...mostly. When using a single Speedlite with an umbrella or soft box, the flash head is often far enough off-center to cause some unevenness in the light pattern. The Lastolite Brolly Grip handily solves the problem by holding the flash horizontally along the modifier's shaft. The molded grip from which the product gets its name is handy when using a small umbrella, allowing one to hand-hold the whole ensemble comfortably and securely. It can also be mounted directly on a standard light stand, or -- as I do -- on a swivel adapter that's on a light stand for the most flexibility in tilt angle. The only gripe I have is that there are no screw-down or locking devices to hold the umbrella shaft; there are two different-sized shaft tubes that have rubber o-rings to prevent slipping, and they work reasonably well, but if there's much of a breeze, if I'm using a large umbrella, or if I have a large tilt angle I find myself reaching for the gaffer's tape to keep everything from slipping, sliding, or twirling. Rated 2 out of 5 by JP 489 from Umbrella Shaft Not Secure The Brolly Grip Handle uses a rubber o-ring to secure the umbrella shaft. The umbrella shaft will rotate and slide when shooting hand held photos. Some type of thumb screw retainer is needed to make the Brolly Grip Handle user friendly. Rated 2 out of 5 by Anonymous from Great idea, but doesn't work that well. Hard to get my Canon 600 flash on and umbrella slips around too much. When attached to a light stand it only points down and that make umbrella problem worse. Good idea, but I should have read the other reviews before purchasing. Rated 2 out of 5 by Don from Needs a redesign A good idea that needs some fundamental rework to be useful. The plastic handle itself seems well made, but I'll be surprised if the flimsy cold shoe lasts very long. The bottom knob (to attach to a light stand spigot) will not screw in or out; apparently the threads are stripped. The real problem is the straight-on mount, adding weight to the already weakest stress point, the cold shoe. Where a regular light stand allows for the flash body to remain upright while turning the flash head to a 90 degree angle to relieve pressure on a cold shoe, the Brolly Handle only works horizontally. The umbrella slots (2 sizes) are another weak point. An inner o-ring is supposed to provide enough friction to prevent an umbrella from falling out. But without a simple tightening knob, the umbrella still flops around. Honestly, I think a standard umbrella swivel adapter works better for handheld work, even though it's less ergonomic. I'm disappointed; it looked great on paper. Rated 2 out of 5 by Thomas Voelkl Photography from Kinda Flimsy This grip is a great idea; not well executed. The first time I used it, my speed light ended up on the floor - fortunately it was carpeted and there was no damage. The light and the umbrella flop around and it requires two hands to keep everything secure. Never mind being dexterous, let an assistant hold it. Rated 4 out of 5 by Teodorico M. from Practical light modifier It is OK for its purpose. I carry on my small camera bag and help with fill light on parks, etc. Weak construction and the umbrella is always loose (not tight fit). I've read reports of the flash coming loose and falling. This is not the case on the unit I got. Actually the flash is very secure.